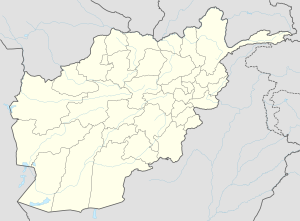 Puli Khumrī (Dari/Pashto: پل خمری), also spelled Pul-i-Khumri or Pol-e Khomri, is a city in northern Afghanistan. It is the capital of Baghlan Province and as of 2002 had a population of 60,000. The spoken language is mainly Persian and the vast majority in this city are Tajiks and Pashtun. The city of Puli Khumri has a population of 221,274 (in 2015). it has 6 districts and a total land area of 3,752 Hectares. The total number of dwellings in this city are 24,586. With an influence from the local steppe climate, Puli Khumri features a cold semi-arid climate (BSk) under the Köppen climate classification. The average temperature in Puli Khumri is 15.9 °C, while the annual precipitation averages 282 mm. July is the hottest month of the year with an average temperature of 28.5 °C. The coldest month January has an average temperature of 3.0 °C. Puli Khumri is a trading and transit hub in northeastern Afghanistan. Agricultural lands account for the largest land use (65%), with the majority of that land in Districts 3, 5 and 6. Districts 1 and 2 have the highest dwelling densities but District 5 is home to the most dwelling units. Puli Khumri has a diverse housing stock consisting of regular, irregular and hillside houses as well as apartment buildings. There are two dams in Puli Khumri, which provides the necessary electricity. Afghanistan's first cement factory was built in 1954 in Puli Khumri with financial support from Czechoslovakia. It is currently owned and operated by Afghan Invest Co., and operated by Ahmad Javid Jaihoon. The limestone is mined from the hill behind the factory. There is a coal mine outside of the city in the village Kan-kan, but the production system is archaic. Agriculture is very important because of the rain and temperature; wheat and rice are the main crops. Hungary headed a Provincial Reconstruction Team in the city until March 2013. Electrical transmission lines built from Puli Khumri are now bringing a steady supply of electricity to Kabul. ^ "The State of Afghan Cities report 2015". ^ Dupree, Nancy Hatch (1977) [1st Edition: 1970]. An Historical Guide to Afghanistan (2nd Edition, Revised and Enlarged ed.). Afghan Tourist Organization. ^ "Climate: Puli Khumri - Climate-Data.org". Retrieved 9 September 2016. ^ Magyar, Honvedseg (2010). "Baghlan taromány CIMIC kézikönyve" (PDF). Magyar Honvédség ÖHP. Archived from the original (PDF) on 2013-12-13. ^ McMahon, Robert (October 20, 2005). "Afghanistan: PRTs Spreading, Though Impact Remains Unclear". Radio Free Europe / Radio Liberty. Retrieved 2007-12-19.